The European leg of qualifiers for Blizzard’s various eSports world championships concluded this past weekend in Prague. Over $300,000 USD was awarded across the Hearthstone, Heroes of the Storm, and World of Warcraft tournaments that played out. On the Hearthstone [official site] front, G2’s Thijs “ThijsNL” Molendijk took home first place and $10,000 USD for his performance – and we’re going to look at exactly how he did that. First off, a cursory glance at any recent meta snapshot from TempoStorm or power rank from LiquidHearth (two of the most popular and prominent go-to places for people to learn about relative deck strength via collated pro player’s opinions and data) shows that three specific archetypes have held the throne in terms of both power and popularity – Midrange Druid, Patron Warrior, and Handlock. In the qualifiers for these regional championships, LiquidHearth noted that players brought these three deck types 22, 15, and 14 times respectively, in contrast with the average of 2.3 appearances that any other archetype had. For pro tournament play, these three styles are the most consistently seen, and certainly the strongest according to people whose job it is to figure that out. Thijs brought all three of these deck archetypes, but he made some modifications to them for this tournament. Here are his three decks, how they’re supposed to work and the noteworthy details and tweaks to all three. Midrange Druid has been a popular style for a long time in Hearthstone because it can be played very consistently and steal games. The core of the Druid toolkit in Hearthstone revolves around plays that cheat the standard mana curve – i.e. playing more expensive cards than they should be able to on a given turn and/or accelerating the rate at which you can play bigger threats. There’s also the popular Force of Nature into Savage Roar combo (14 [or more!] damage for 9 mana). Druids sometimes give up some early pressure for this technical advantage. He uses only one Darnassus Aspirant. This particular card has drawback – losing a mana crystal when the Darnassus Aspirant minion is killed – which can be problematic in the late game. Taking one out frees up a card slot for another tech choice. There are two Shade of Naxxramas cards. These tend to get cut when the meta is more aggressive or there is more board-wipe removal in play since their stat value (the damage and health numbers) is low for 3 mana, and they can be easily removed by cards that hit all minions if they don’t get played early. Here they improve the odds Thijs can utilize all of his mana by making a turn 3 play (that’s the point where you usually have 3 mana crystals) even if he didn’t draw cards that would increase the mana he has available during the previous turns. That increasing of available mana is called “ramping”, by the way. Thijs also has two Big Game Hunters. This is purely a tech choice in response to the prevalence of Handlock as Handlock is a deck that runs so many minions that have 7 or more attack. They can be removed by the Big Game Hunter thanks to its battlecry which lets you destroy a minion with 7 or more attack when you play the card. Fun fact: if anything, players are opting to go without BGH at all on the ladder these days, since so few decks run organic targets for it. Harrison Jones is included as weapon removal (its battleecry destroys an opponent’s weapon and draws cards equal to that weapon’s durability). This is aimed at the Patron Warrior match-up because the Patron Warrior deck relies on weapons for early removal and as activators for particular card combos. It can also be useful as an emergency response to Lord Jaraxxus – a card which transforms the hero into Jaraxxus and gives him Blood Fury, a weapon with 3 attack and 8 durability. 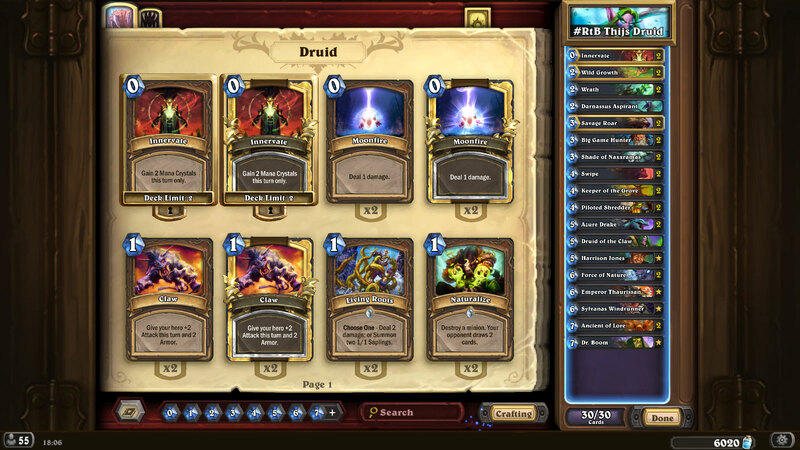 The decklist is otherwise a standard spread of Druid removal and sticky minions (ones which are hard to remove) to ensure a board presence prior to unleashing the combo. Thijs does include Emperor Thaurissan in this list, which is only a safe choice due to the fact that he was unlikely to hit any very fast decks in this tournament – Emperor reduces the cost of cards in your hand by one at the end of each turn so taking advantage of a reduced-cost combo or other late-game value from Emperor doesn’t happen if you don’t live that long! Midrange Druid is not openly favoured against or weak to any of the top tier decklists right now. It can be a tough matchup for Patron Warrior, but Patron is another deck that excels at stealing games and winning from behind. Handlock (so-called because the Warlock wants a large hand of cards!) as a style revolves around manipulating your own health pool and hand size to get minions on the board which have substantially better stats than their cost would, on average, entail. These are generally variable-cost or stat minions like Mountain Giant (who costs 12 mana but that decreases by 1 for each other card in your hand), Molten Giant (who costs 20 but that decreases by 1 for each damage your hero has taken), and Twilight Drake (whose measly 1 health increases by 1 for each card in your hand). The intention is the give you an above-curve presence (i.e. you’ve got more oomph than you “should” at a particular point in the game) that is difficult to respond to for most classes. 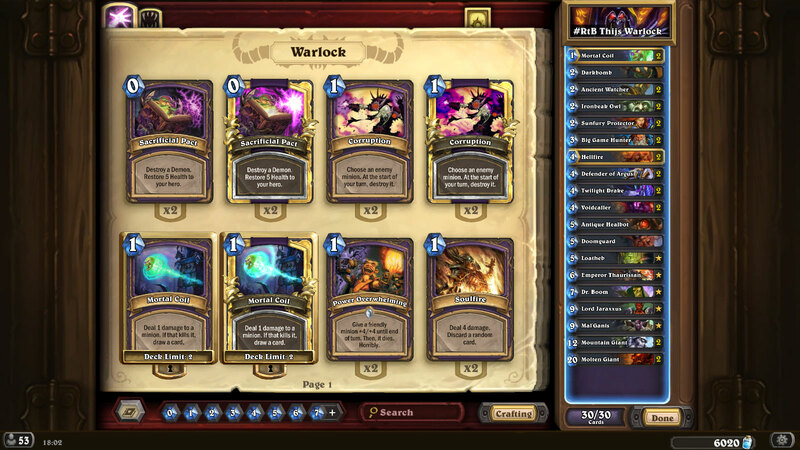 Thijs plays the Demon variant on this deck archetype – you can see a basic Demon Handlock deck here – which includes the end-game Demons Jaraxxus and Mal’Ganis. There are also two Voidcallers whose deathrattle puts a random demon from your hand into the battlefield and potentially gets the demons out early (another way to cheat that curve), and a lone Doomguard as another way to get value from the Voidcallers (Doomguard has charge so if the death of a Voidcaller brings it into play you can ttack with it immediately) or add damage to finish an opponent off in the late game. His tech choices reveal that he is focused on being the aggressor in a Warlock mirror matchup. Once again, double Big Game Hunters to handle his opponent’s Giants or other eligible targets (Mal’Ganis – a powerful demon who beefs up other demons and makes your hero immune – is a big one in this matchup). Only one Antique Healbot. The 5-mana mech with a big heal (its battlecry restores 8 health to the hero) is one of the only neutral heals in the game, and potentially one of the best healing cards for any class at all. Since Handlock is very risky in terms of how low it can place your life total early on, having Healbots to respond to threats is often mandatory, but Thijs correctly looks to the slower meta and decides that a second Healbot wouldn’t allow him to be the player applying pressure which his opponent is then forced to answer. Double Hellfire. The second Hellfire isn’t always taken in Handlock, but it’s a smart and safe tech choice when you’re expecting to face any significant quantity of Patron Warrior decks (as Thijs was in this tournament) to ensure you have it when you need it. This is because of the 3 health Grim Patrons used in those Patron Warrior decks. When a Grim Patron survives damage it summons another Grim Patron so the 3 damage to every character which Hellfire offers lets you squash then even if the patrons have started to snowball. The rest of this list is largely unsurprising. LiquidHearth refers players to a list that Thijs himself created as their ‘standard’ Handlock, and you can see some of the other, non-tech choices that feature in a less specialized version of this deck. Notably, that link takes you to a non-Demon variant, and it plays cards that are safer in a general ladder environment and meta. Everyone’s favourite reason to get in here! In the current tournament scene, the meta is 100% decided by Patron Warrior – even if you don’t play it. Decks have to be able to beat Patron Warrior to be in contention, and any deck that doesn’t trade efficiently with Patron hasn’t been seen in top-level competitive play for a very, very long time. Patron looks to cycle* through the deck very aggressively to find cards that set up combinations to flood the board with Grim Patrons or set up high-damage Frothing Berserkers using Whirlwind damage effects. Whirlwind deals 1 damage to all minions so it can be used to multiply the numbers of Grim Patrons on the board or plump up the damage Berserkers can do. They also add in weapons and spells to remove the opponent’s minions along the way. It’s a deck that can play well from behind, since you can develop a board quickly or draw through your deck quickly to find all of the pieces necessary to pull off a one-turn kill. Thijs opts for only one Fiery War Axe, which makes sense in a slow meta, since there won’t be many early-game minions to answer using the 3 damage it offers. It’s simply not as automatic of a requirement to play with in a meta with fewer early game trades to worry about, and running the second one is almost exclusively done to try and increase your chances of getting it in your initial mulligan (the bit at the start where you can ditch some or all of your hand of cards in the hopes of drawing a better selection). This deck uses all of the armor cards – two Armorsmiths (who gain 1 armor when a friendly minion takes damage) and two Shield Blocks (gain 5 armor and draw a card). These help Patron claw its way back to a stable position if the mulligan or early draws aren’t favourable. The Shield Blocks are also two of the NINE cards in this deck that provide card draw – that’s for that aggressive card cycling we were talking about earlier. A lone Shield Slam serves as excellent removal (it deals 1 damage for each armor you have), particularly if paired with a Shield Block (see previous point). This gives slightly more of a control element to the deck. Most of this deck is quite standard, though, and you see the above variations come or go based on personal preference, taste, or prevalence of aggro. The single – and fairly massive – tech choice here is the inclusion of Brawl. Brawl destroys all minions except one and is therefore great for a Patron player who is waiting to set up a combo and needs to continue cycling cards to find pieces for it, but cannot afford to leave the board state uncontested. It’s also massively powerful against Handlock, which is one of the Patron Warrior’s significant threats. One interesting thing about Thijs’ tech choices is that they’re all done to balance the matchups he is expecting to see. He has Loatheb for anti-Druid (to increase spell costs and prevent the fabled Force of Nature into Savage Roar combo mentioned earlier) in his Handlock, but not the other two decks; he runs Harrison Jones in Druid to help its Patron match-up, but not in Handlock or the mirror match-up. Teching Handlock aggressively for the mirror match-up helped to isolate a potential weakness in a 5-game series where all three decks could see any of the six possible matchups. Judging by the LiquidHearth data showing the frequency with which these three decks (using varying tech choices) were brought to the qualifiers, and the fact that they were the winning decks in the European Regionals, it seems quite likely that we will see similar decklists going into BlizzCon. These are all decks that can win games from behind by finding critical combo pieces and pushing a ton of damage very quickly. We should not that these are not ladder decklists, so you may not see these exact decks on ladder, but all three are standard archetypes that are being played by lots of regular players in ranked play every day (without some of the specialized tech choices to swing particular matchups!). Lastly, what does this mean for BlizzCon? A lot of players and fans expect to see more of the same, but clever pro players have been surprising us with unexpected deck picks in top-level play for a long time. There are no deck archetypes that are overall better, but with the Hearthstone World Championship and a $100,000 USD first place prize on the line, playing the odds with a deck designed to snipe one particular match-up could pay off for someone big time. Tagged with Blizzard Entertainment, feature, guides, esports, Hearthstone.